This Honey Garlic Chicken recipe is so easy to prepare and will be a family favorite! Made with chicken breasts and a four ingredient honey garlic sauce. Add cut up broccoli, cauliflower, peppers, carrots or peas for honey garlic chicken stir fry. A weeknight dinner doesn’t get much easier than this honey garlic chicken! It’s even faster than takeout if you take into account the time it takes to drive to the restaurant, wait for the food and then drive home again. 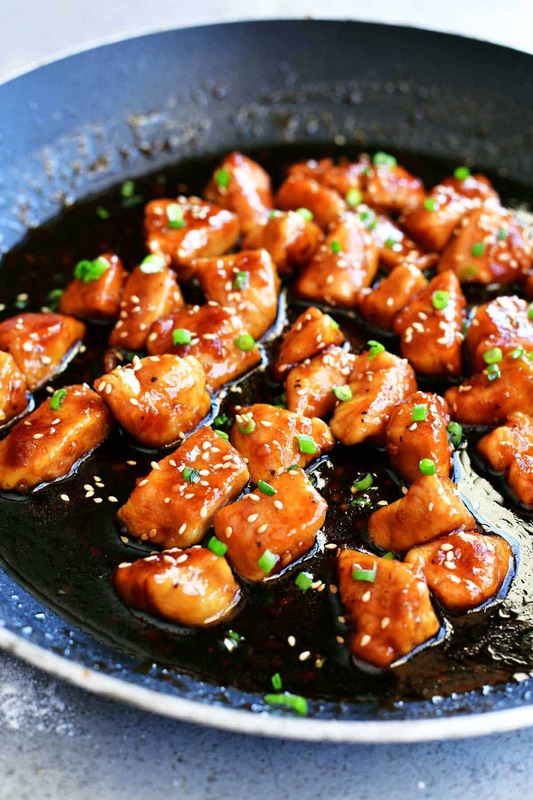 Start by making the sauce for this honey garlic chicken by whisking together the honey, soy sauce, olive oil, and hoisin sauce. Set the sauce mixture aside until later. For this recipe, I used boneless, skinless chicken breasts. You could also use chicken thighs if you prefer your meat to have more fat. Try to cut the chicken into evenly sized pieces so that they will finish cooking at the same time. After cubing the chicken, season it with salt, black pepper, and garlic powder. To get a nice, crispy coating on the chicken, coat it with flour before frying it. I’ve found that the easiest way to do so is to put the chicken pieces in a gallon sized plastic bag. Add the flour, close the top of the bag, and shake the chicken to coat it evenly with flour. Next, it’s time to cook the chicken. Heat the olive oil in a large skillet. Add the seasoned and coated chicken. Cook for about three minutes before flipping it over to cook on the other side. Add the minced garlic, stir and cook for two minutes. By the way, this is our favorite frying pan. You see it in so many of my videos and blog posts. We have this size as well for making omelets. Finally, it time to add the sauce mixture. Turn the heat down to medium and pour in the sauce. Stir and cook for 3-4 minutes. Garnish with toasted sesame seeds and sliced green onions before serving over rice, noodles, or cauliflower rice. My son has already asked me to make this twice in the past week! I’d say it was a huge hit with my family. 1. Do I have to use chicken breasts for this recipe? The recipe calls for chicken breasts but chicken thighs or chicken tenderloins would work as well. 2. 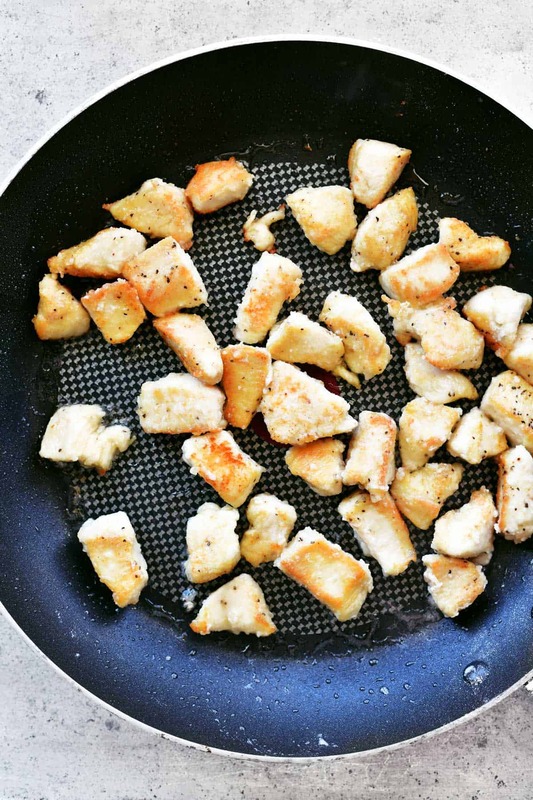 Why are the chicken breasts cut into small pieces before cooking? Chicken breasts are cut into pieces in this recipe so that it cooks faster, there are more crispy bits and you get honey garlic sauce on more areas. But the chicken breasts can be left whole if you prefer but you will need to extend the cooking time depending on the thickness of the chicken breasts. 3. What else can I add to this honey garlic chicken? Stir in cut up broccoli, cauliflower, peppers, carrots or peas for honey garlic chicken stir-fry. 4. My sauce won’t thicken. What should I do? If you want a thicker sauce, mix one tablespoon of cornstarch into two tablespoons of cold water. Stir the mixture into the sauce. 5. My honey garlic sauce is too thick? What should I do? If you want a thinner sauce, add a little water at a time until it reaches the consistency you prefer. 6. How can I make this recipe gluten free? To make this gluten free, use a gluten free flour or cornstarch in place of the flour or skip the flour coating and thicken the sauce with cornstarch as mentioned above. Also, be sure to use gluten free soy sauce, hoisin sauce, and sesame seeds. 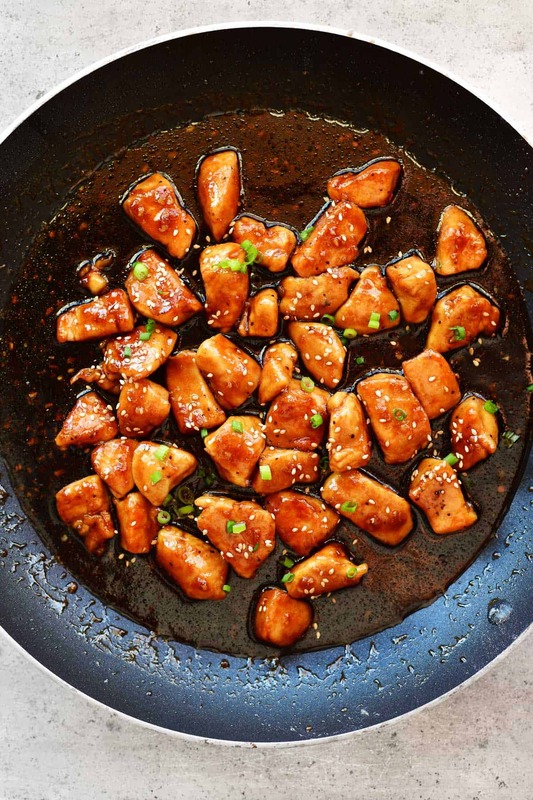 Orange Chicken: This 30-minute skillet recipe for orange chicken is easy to make and so delicious! It’s an easy dinner recipe that your whole family will love. General Tso Chicken: Skip the takeout and make this General Tso Chicken recipe at home! It’s easy to make and full of flavor. Serve over rice or noodles for a family dinner. Stir Fry Sauce: This stir fry sauce recipe can be used for vegetables, chicken, beef, shrimp, and pork. It is super easy to make and totally adaptable. 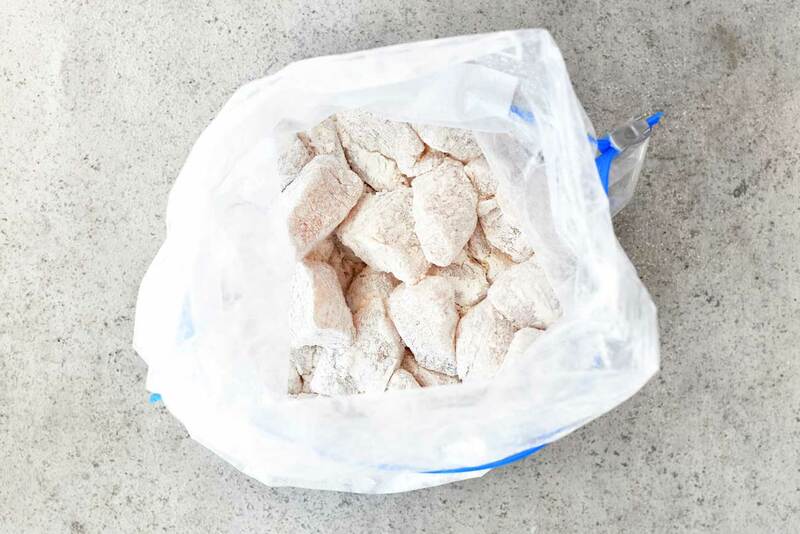 Store in the fridge or freezer for later! 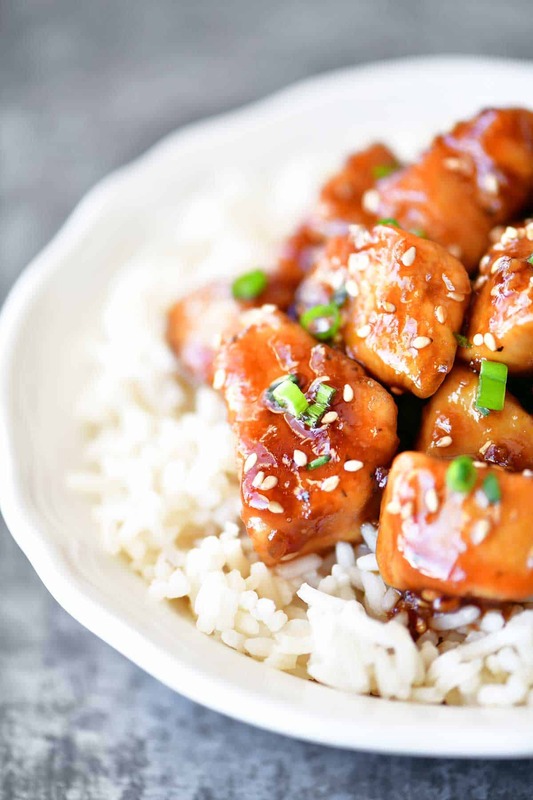 Slow Cooker Honey Sesame Chicken: Slow Cooker Honey Sesame Chicken is a Crock Pot recipe that’s easy to make, cheaper than takeout and tastes better too! It’s a family-friendly recipe that will become a favorite. This Honey Garlic Chicken recipe is so easy to prepare and will be a family favorite! Made with chicken breasts and a four ingredient honey garlic sauce. 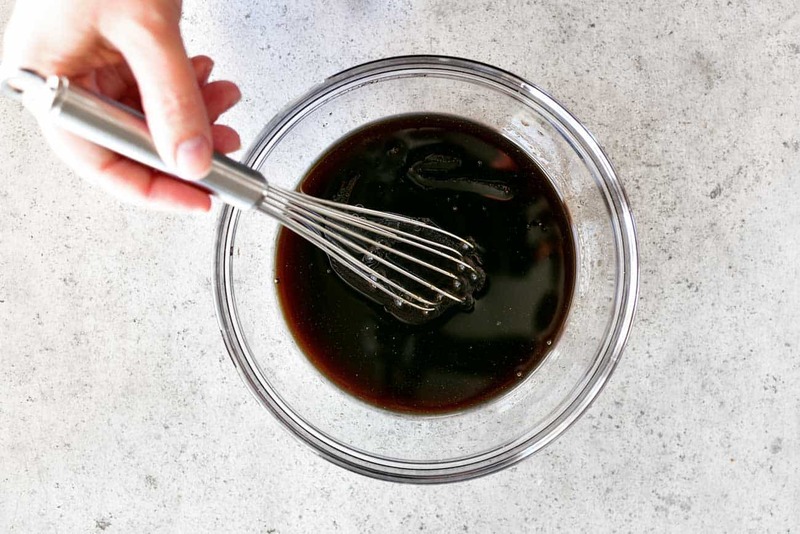 Whisk together honey, light soy sauce, olive oil, and hoisin sauce in a small bowl. Set aside for later. 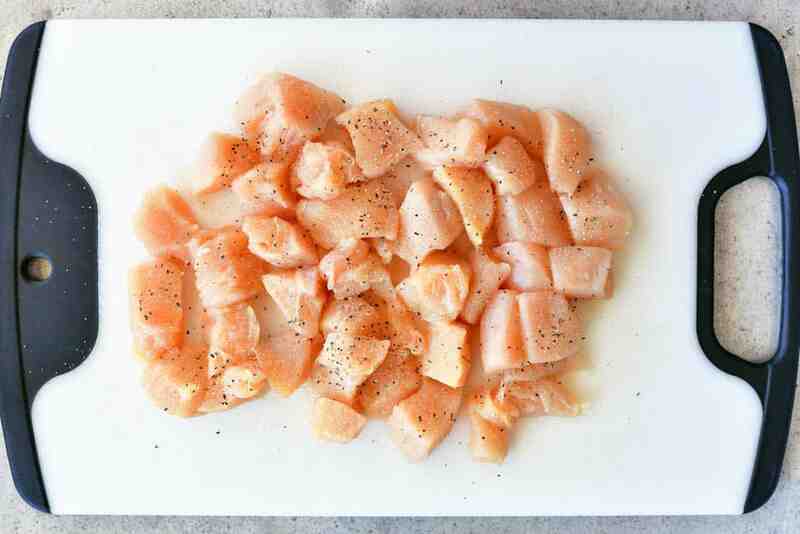 Cut boneless, skinless chicken breasts into pieces. Sprinkle with salt, black pepper, and garlic powder. Put the chicken pieces in a gallon sized plastic bag. Add the flour, close the top of the bag, and shake the chicken to coat it evenly with flour. Heat olive oil over medium-high heat. Add the flour coated chicken. Cook for about three minutes, flip the pieces over and cook for another three minutes. Turn the heat down to medium. Add the honey garlic sauce. Stir and cook for 3-4 minutes. Sprinkle with toasted sesame seeds and sliced green onions. Amazing recipe! We will be making this again! This is amazing! 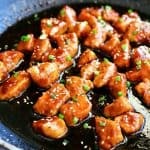 Do you have recipe that is similar to/tips on how I could turn this into more of a General Gao’s/Tsao’s chicken recipe? Thank you – this chicken is like crack in our house!!! Thank you! I do not right now but I am working on one! Hey, do you have to use soy sauce? First of all the soy takes over the honey. Maybe cut the soy sauce in half. That is the only issue I see. I ended up having to add another 1/2 of honey to be able to taste honey and not just soy sauce. Perfect family meal…pleased everyone in our family of eight! This was a winner for my family. I made it last night in between working It was easy and fast! Fantastic! I love to hear that! Awesome!! I’ve made it twice. Once using boneless thigh and once boneless breast. Both were very good. Definitely a favorite!